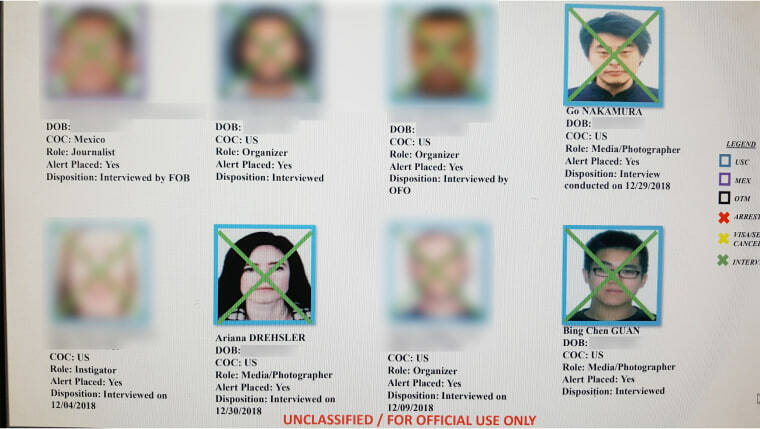 The list, dated Jan. 9, 2019, is titled “San Diego Sector Foreign Operations Branch: Migrant Caravan FY-2019 Suspected Organizers, Coordinators, Instigators, and Media” and includes pictures of the 59 individuals who are to be stopped. The people on the list were to be pulled aside by Customs and Border Protection agents for questioning when they crossed the U.S.-Mexico border to meet with or aid migrants from the Honduran caravan waiting on the Mexican side of the border. The list includes 10 journalists, seven of them U.S. citizens, a U.S.-based attorney and others labeled as organizers and “instigators,” 31 of whom are American. Symbols on the list show that by the time it was compiled 12 of the individuals had already been through additional questioning during border crossings and nine had been arrested.